Staying hydrated in this intense Dubai Summer Heat is crucial for healthy skin and hair, and what better way to replenish moisture than using natural ingredients. I was delighted when Palmer’s decided they wanted me to be their Brand Ambassador, because I have in fact been using the Palmer’s body lotion with the Cocoa Butter Formula as a staple in my skin care routine since pregnancy, and truly believe in the product. 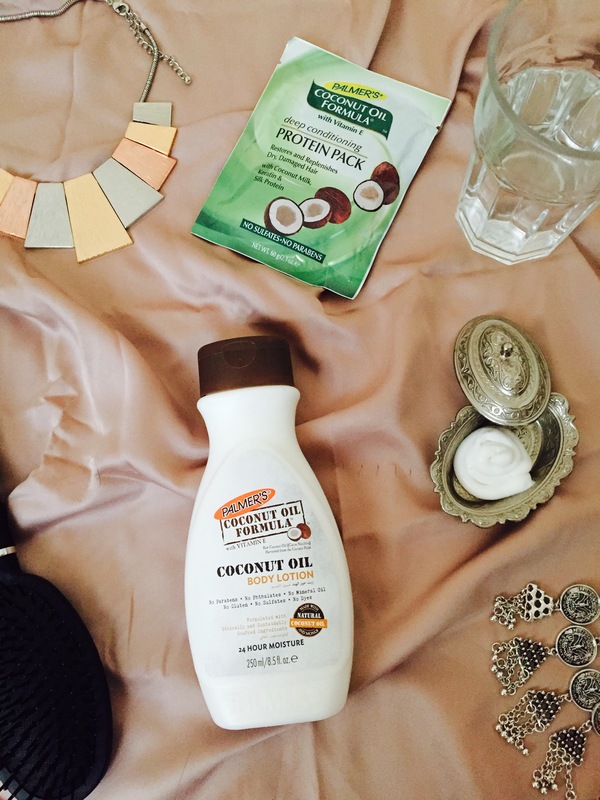 I was excited to try out the products from the Coconut Oil Formula range that I received a few days ago. The first one being the Palmer’s Coconut Oil Body Lotion and the other is a Deep Conditioning Protein Pack for dry damaged hair. We all know Coconut Oil is all the rage right now, and I have seen it being used in all sorts of different ways, the latest and most bizarre one being “Oil Pulling” for dental hygiene. Palmer’s Coconut Oil Body Lotion combines three key ingredients: Coconut Oil, Monoï Oil and Sweet Almond Oil, along with an infusion Tiaré flower petals for deeply moistursing and softening the skin. I tend to lather it all over my body before going to bed because, as expected, the lotion does have a slightly sticky consistency when applied, though it soaks in pretty well soon after. The best part is that the lotion is free of nasties such as Parabens and Dyes, and is also formulated with ethically and sustainably sourced ingredients. A sweet aroma lingers after applying the lotion and has left my skin feeling pampered and hydrated. In my weekly calendar, I reserve Fridays for Face Masks. This Friday though, I decided to also try out the Palmer’s Protein Pack for dry damaged hair to well and truly pamper myself. When I opened up the pack, I was surprised at just how much product was inside, and you can easily get two uses out of it for those with mid to short length hair. The formula looks very much like the lotion, in that is is white and of thick consistency, and smells quite strongly of Coconuts! The formula contains Coconut milk, Keratin and Silk Protein, and I began by applying it all over my head, and then concentrating on the ends of my hair. Though the pack advises to leave on for 10-20 minutes before washing off, I had mummy errands to run around the house, and as with all other masks that I apply, I left this one on for about 45 minutes before washing it off. Once washed, my hair felt incredibly soft and shiny, especially the ends that were very dry before. The only thing I was not a big fan of was that it did leave my hair smelling faintly of coconuts, though I didn’t mind it too much since the condition of my hair was better than it had been in a very long time! However, if you love the smell of coconuts, then you will definitely love this product lots! Like the body lotion, this product too is free of nasty chemicals such as sulfates and parabens, and is great for giving your dry limp hair a quick and hydrating boost. Prices and where to find them? Sold at: Lulu Hypermarket, Geant and Carrefour. As the Brand Ambassador for Palmer’s I hope to be bringing to your attention more of their skin and hair care products, and if you would like to find out more about what they have on offer, simply head on over to their website. For regular updates, you can also find them on Facebook, Instagram, Twitter and Youtube. Note: I received these products by Palmer’s to be reviewed. However, all views and opinions are honest and my own. Looks like a lovely product. Will have to try it.